Groups > Persecuted Christians > Discussions > Topic: THE LAST DAYS! 36.] No one knows the day and the hour. The angels in heaven don't know, and the Son himself doesn't know. Only the Father knows. 37.] When the Son of Man appears, things will be just as they were when Noah lived. 38.] People were eating, drinking and getting married right up to the day that the flood came and Noah went into the big boat. They didn't know anything was happening until the flood came and swept them all away. That is how it will be when the Son of Man appears. 40.] Two men will be in the same field, but only one will be taken. Two women will be together grinding corn, but only one will be taken. The other will be left. 42.] So be on your guard! You don't know when your Lord will come. 43.] Homeowners never know when a thief is coming, and they are always on guard to keep one from breaking in. 44.] Always be ready! You don't know when the Son of Man will come. 1.] After Jesus left the temple, His disciples came over and said, "Look at all these buildings!" "Jesus replied, "Do you see these buildings? They will certainly be torn down! Not one stone will be left in place." 3.] LATER, as Jesus was sitting on the Mount of Olives, his disciples came to Him in private and asked, "When will this happen? What will be the sign of your coming and of the end of the world?" Don't let anyone fool you. 5.] Many will come and claim to be me. They will say that they are the Messiah, and they will fool many people. 6.] You will hear about wars and threats of wars, but don't be afraid. These things have to happen first, but that isn't the end. 7.] Nations and Kingdoms will go to war against each other. People will starve to death, and in some places there will be earthquakes. 8.] But this is just the beginning of troubles. 9.] You will be arrested, punished and even killed. Because of me, you will be hated by people of all nations. 10.] Many will give up, and will betray and hate each other. 11.] Many false prophets will come and fool a lot of people. 12.] Evil will spread and cause many people to stop loving others. 13.] But if you keep on being faithful right to the end, you will be saved. 14.] When the good news about the Kingdom has been preached all over the world and told to all nations, the end will come. 15.] Someday you will see that "Horrible Thing" in the Holy Place, just as the prophet Daniel said. Everyone who reads this must try to understand! 16.] If you are living in Judea at that time, run to the mountains. 17.] If you are on the roof of your house don't go inside to get anything. 18.] If you are out in the field, don't go back for your coat. 19.] It will be a terrible time for women who are expecting babies or nursing young children. 20.] And pray that you don't have to escape in the winter time or on a Sabbath. 21.] This will be the worse time of suffering since the beginning of the world, and nothing this terrible will ever happen again. 22.] If God doesn't make the time shorter, no one will be left alive. 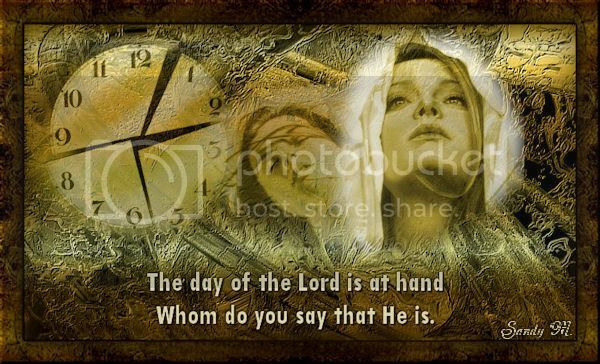 But because of God's chosen ones, he will make the time shorter. 23.] Someone may say, "Here is the Messiah!" or "There he is!" But don't believe it. 24.] False messiahs and false prophets will come and work great miracles and signs. They will even try to fool God's chosen ones. 25.] But I have warned you ahead of time. 26.] If you are told that the Messiah is out in the desert, don't go there. 27.] 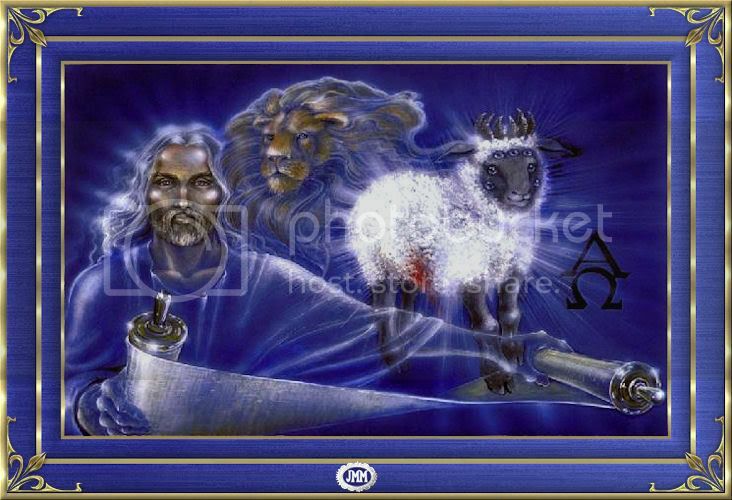 The coming of the Son of Man will be like lightening that can be seen from the east to the west. 28.] Where there is a corpse there will always be buzzards. 30.] Then a sign will appear in the sky. And there will be the Son of Man coming on the clouds of heaven with power and great glory. 31.] At the sound of a loud trumpet, he will send his angels to bring his chosen ones together from all over the earth. A BOOK OF PROPHECY ABOUT THE LAST DAYS! 1.] After this I looked and saw a door that was opened into heaven. Then the voice that had spoken to me at first and that sounded like a trumpet said,"Come up here! I will show you what must happen next." 2.] Right then, the Spirit took control of me, and there in heaven I saw a throne and someone sitting on it. 3.] The one who was sitting there sparkled like precious stones of jasper and carnelian. A rainbow that looked a emerald surrounded the throne. 4.] Twenty four other thrones were in a circle around that throne. And on each of these thrones there was an elder dressed in white clothes and wearing a gold crown. 5.] Flashes of lightening and roars of thunder came out from the throne in the center of the circle. Seven torches, which are the seven spirits of God, were burning in front of the throne. 6.] Also, in front of the throne was something that looked like a glass sea, clear as crystal. who was and is coming." I had planned to continue this study of Revelation;however, Revelations is fairly long, I have several studies going on already, and with school beginning next week, I have decided that I will put off doing a study of Revelation until much later. That does not mean that you can't read Revelation on your own though. It's always good to continue your bible readings and studies in your own home or other places, and reading the bible is always good in any case. I will continue with my other studies as I have the time and I will leave this thread on for you to view or add comment! I promise I will continue to be active on some of the other threads though! A year ago Mohammed Khidir Khalil and his family fled Islamic hostilities in Sudan and obtained refugee status in Egypt. Life was promising as his unbelieving wife attended church with him. Today, however, the 38-year-old convert from Islam is back in Sudan fighting to recover his family after his in-laws compelled his wife to declare her faith in Islam and divorce him. Two Lao and two Thai Christians who were seized from a private home and arrested earlier this month have been charged with "spreading the Christian faith without official approval." At least 18 people have died and 66 wounded when assailants burst into the Africa Inland Church (AIC) and the Catholic Church in Garissa, a provincial capital about 120 miles west of the Somalia border. Eye-witnesses said that the attackers shot the two policemen guarding the AIC church, then took their guns and began shooting at worshipers. Within the last week, Behnam Irani became so sick that he lost consciousness. As a result, he was finally allowed to be transferred to to prison hospital. His family had been worried for weeks that he seemed to be suffering from an intestinal issue. Instead, it appears that Behnam suffers from a bleeding ulcer. We are thankful Behnam is being treated by a doctor, but we encourage you to continue to pray for him since the situation is so serious.